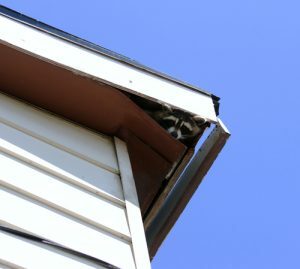 If you hear loud thumping, walking, scratching, or scampering sounds coming from above your head, chances are you have raccoons living in your attic. Raccoons are intelligent creatures and have no problem living alongside humans in urban environments. They love the warmth and protection your attic provides, especially when needing to make a den site to birth their young. Nicknamed ‘masked bandits,’ they also appreciate the easy meals they steal from your yard, garbage cans, and pet food dishes. Raccoons are exceptional climbers. They use their strength along with their long fingers and nails to pry open weak parts of your home and then squeeze their way in. That’s why it’s important to have your home inspected by a wildlife expert like Critter Control® of Orlando to check for potential entry points. Chimney – Raccoons climb into the chimney and make their den on top of the fireplace damper. Plumbing Mat – Generally, there is a space surrounding the cylindrical vents that are covered with a rubber matting. Oftentimes, raccoons will pull on the mat until it tears, and then squeeze themselves into the hole. Roof-Soffit Intersection – This is where the soffit sits slightly above a section of your roof, where the upper and lower roof comes together. Raccoons use their upper bodies to open the soffits made from flimsy materials such as aluminum or plastic. Roof Vents – Though the vents on your roof are designed to let the air in your attic circulate properly, the coverings are usually thin. Once on your roof, the raccoon feels the air escaping, and pry’s its way into the vents. Roof Edge – High amounts of moisture cause wood and roof tiles to deteriorate where the eavestrough meets the house at the edge of your roof. To gain access, raccoons easily tear away the rotting materials. Critter Control® of Orlando has over 30 years of experience removing raccoons from the attics of both homes and businesses. Our technicians will perform a thorough inspection of your home to find all possible entry points. Once the animals are safely and completely out, we will offer a solution to ensure the problem doesn’t happen again. If you are having raccoon issues or would like to prevent future invasions, call us today at 407-295-7194 for a free estimate.